Hi Lollipop fans. 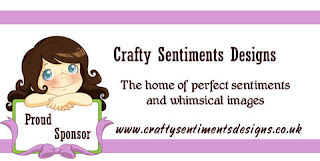 In case you missed it last week, Lollipop Crafts has a new sponsor, Crafty Sentiments Designs. They are sponsoring our current challenge which can be found here. Now here's a bit about them. Crafty Sentiments Designs was started in 2009 by Suzette Winch, the owner. We carry our own brand of exclusive Rubber stamps, Digital stamps, Sentiments and cutting dies, perfect for all your scrapbooking and card making. Now onto some creations from the DT using these darling images. Crafty Sentiments Designs will be giving one randomly chosen winner 3 digi images. Don't forget to link up your Halloween projects here. Bye for now! Beautiful creations DT girls. Adorables images.